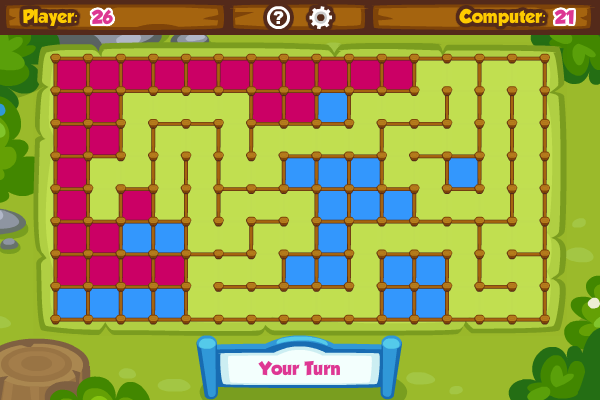 In this game there are poles arranged in a grid. You and the computer will take turns to put a fence between two poles. If the fence you put just caused a piece of land to be surrounded by four fences, then the piece of land will be yours and you can put another fence again. The game is over when all the pieces of land are occupied, the player with the more pieces of land wins. Slay is a simple to learn game of strategy and cunning set in medieval times. The island is divided up between the six players, and you must try to capture your enemies' land and link up your own territories to create larger and stronger ones. BONAPARTE - THE BATTLE FOR POWER AND FREEDOMWe\\'re back in the year 1789, the French Revolution has just begun. Now you\\'re getting the chance to step into Napoleon\\'s shoes. Stranded by your people on a deserted planet, you must rebuild everything and reach the stars in an epic quest for freedom and glory. The planet you are sitting on right now can become your Asgard1 or your tomb... Start your ascension right now! Tank's war has started! Take an enemy tank to the aim and shoot. You can change the position of the tank's cannon to point your aim. Try to make it fall into the Sea. Choose the right strategy to check you logic and keenness of vision. Free to play!